We asked women what they needed to perform at their absolute peak. Their answer and our research are reflected in this unique daily dietary supplement, scientifically formulated with a proprietary blend of Con-Cret Patented Creatine HCI, Capsimax Capsaicin, natural caffeine and other essential nutrients. 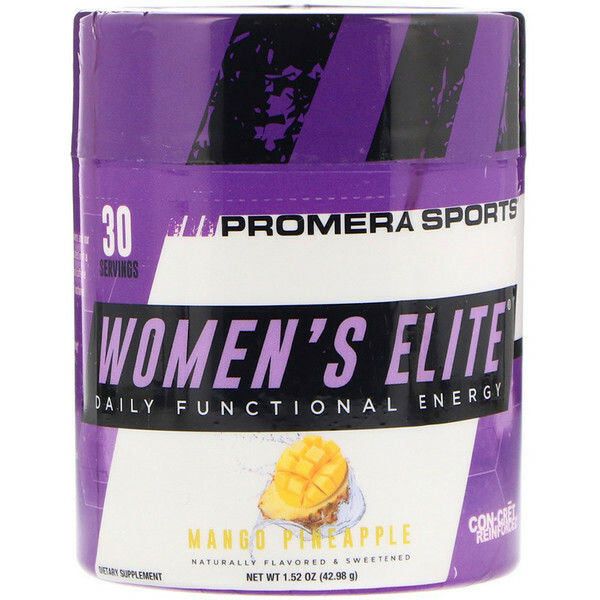 Women's Elite is an excellent daily supplement for functional energy, appetite suppression, and weight control. Mix one scoop with 8 oz. of water. Can be taken daily at anytime, or prior to any physical activity for increased energy. The amount of natural caffeine per serving is 115 mg.
Natural flavors, stevia rebaudiana leaf extract. Gluten free. No calories, no carbs, no sugar, no artificial colors, flavors or sweeteners. Not intended for individuals under the age of 18. Consult your physician before using this product and if you are taking any prescriptions or over the counter medications or supplements. Do not take if you are pregnant, contemplating pregnancy or nursing. In the event of any adverse reaction discontinue use immediately and consult a physician. Keep out of reach of children. Note: Store in a cool dry place. Do not use if safety seal are broken or missing.